Penguins can sniff out the odor of lifelong mates, helping them reunite in crowded colonies, and also can identify the scent of close kin to avoid inbreeding, scientists said on Wednesday. Some seabirds have previously been known to use their sense of smell to find food or locate nesting sites but the experiments with captive Humboldt Penguins at Brookfield Zoo near Chicago proved, for the first time, that the birds use scent to discriminate between close relatives and strangers. "Other animals do it, we do it, so why can't birds?" said Jill Mateo, a biopsychologist at the University of Chicago, who worked with graduate student Heather Coffin on the research published in the journal PLoS ONE. "Their sense of smell can help them find their mates and perhaps choose their mates," Mateo said. "Seafaring birds that travel long distances in the ocean use odors to find food and use odors to recognize nests but we didn't know what odors or the extent to which they could use odors to recognize kin," Mateo said. "This was the first study to show they can use odor to recognize genetic differences," she said. Researchers worked with two groups of endangered Humboldt Penguins raised at the zoo, totaling 22 birds. Their behavior was recorded as the birds examined scents emitted by oil from the birds' preening glands. The gland near the bird's tail excretes oil used to keep them clean but also has an olfactory purpose. 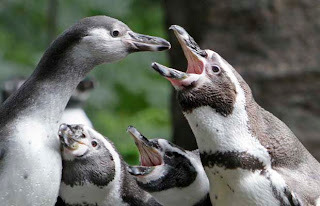 In one experiment, penguins with mates preferred the comfort of their mates' scent over the scents of unfamiliar penguins. In another, penguins without mates spent twice as long investigating unfamiliar penguins' scents than those belonging to their close relatives. "In all sorts of animals that we study, including human babies, novel odors, novel cues, are investigated longer than less-novel cues," Mateo said. Scent is used by many species to attract mates, or to avoid mating with relatives, she said. For Humboldt penguins, which nest on Peruvian cliffs and spend long periods foraging at sea, odor acts as an identifier when they return to colonies crowded with thousands of birds nesting in cracks and crevices. 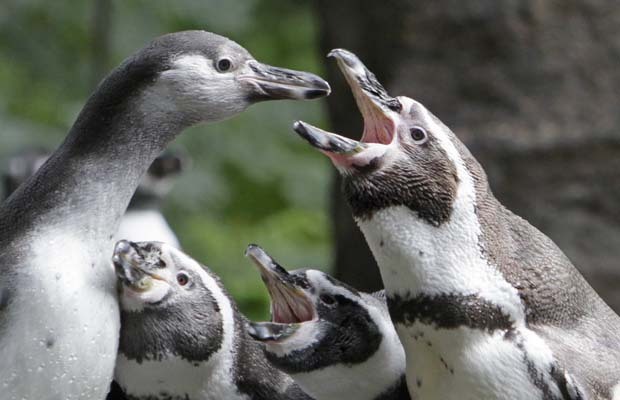 "It's important for birds that live in large groups in the wild, like penguins, to know who their neighbors are so that they can find their nesting areas and also, through experience, know how to get along with the birds nearby," said animal behavior expert Dr. Jason Watters of the Chicago Zoological Society, which operates Brookfield Zoo. "It could also be true that birds may be able to help zoo matchmakers in determining potential mates," Watters said. "You could imagine that if (naturalists) were trying to reintroduce birds to an area, you could first treat the area with an odor the birds were familiar with. That would make them more likely to stay," he said.